Xiaomi has today announced that it will remove Cash-on-delivery (COD) payment option for the upcoming Redmi Note 5 Pro sale on Mi.com and Flipkart. The company has said that this move will restrict the reselling of Xiaomi devices and would also give genuine consumers a better chance to purchase the device. “In order to restrict reselling, we have decided to remove COD payment option for the upcoming sales of Redmi Note 5 Pro on mi.com and Flipkart (Only for initial few sales). This would give a better chance to our Mi fans to purchase our products,” writes Xiaomi on Mi forum. Earlier, in Flipkart listing, we noticed the message that Xiaomi will not offer COD payment option for next sale of Redmi Note 5 Pro. The Redmi Note 5 and Redmi Note 5 Pro went on flash sale exclusively on Flipkart and Mi.com on February 22. 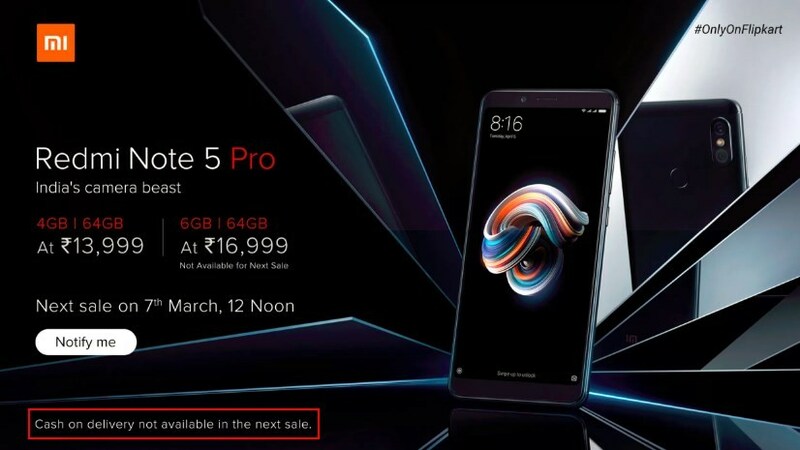 The company says that over 3 lakh units were sold out within minutes and the Redmi Note 5 was available for few minutes while Redmi Note 5 Pro went out of stock in seconds. So, it looks like the company is removing COD option only for Redmi Note 5 Pro. The company further says that this move will curb the reselling of its units by some resellers. The company assures that it will always continue to discourage unauthorized reselling across all its channels. “We have always, and will continue to stringently discourage unauthorized reselling across all our channels,” the forum post further added. Moreover, Xiaomi has advised users to keep a check on the rejection of COD orders over a specified number and also urged them to refrain ordering from multiple IDs with the same user info. This will save users from getting their Mi accounts blocked. Xiaomi Redmi Note 5 and Redmi Note 5 Pro will be available via next flash sale in all four color variants including Lake Blue and Rose Gold on March 7 at 12:00 PM on Flipkart and Mi.com.